Price includes one colour print. World class travellers want your Branded Metallic Coloured Luggage Tags. 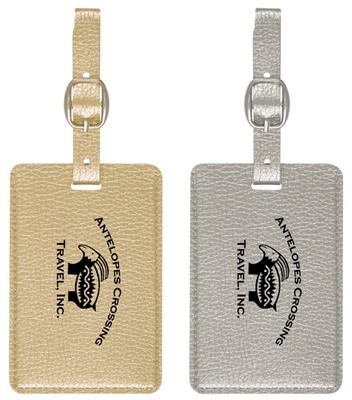 These high class luggage tags are made from a metallic polyurethane material. They have a luxurious soft touch with an adjustable strap. The tag comes with a blank ID card. Makes a premium give-away for travel agents, airlines and cruise lines to offer to clients. Available in metallic gold or silver. We have a limited range standard of print colours for this product. If the PMS colour match you require is different to what is listed above, there is an additional cost of $40 +GST for each colour.